forth new life in me? For more A Virgin a Day photos, click here. For more Haiku Heights with the theme “Life, click here. Posted on December 12, 2010, in A Virgin a Day, Arizona, Haiku Heights, Mellow Yellow Monday, Mission San Xavier del Bac, my digital photos, my haiku, my senryu, Ruby Tuesday, Sonoran Desert, Tucson. Bookmark the permalink. 24 Comments. The flames of faith burn bright and leads you kindly from darkness to light. Both beautiful Haiku’s and colorful pictures too!! Both Haiku are very beautiful. I love the candles. 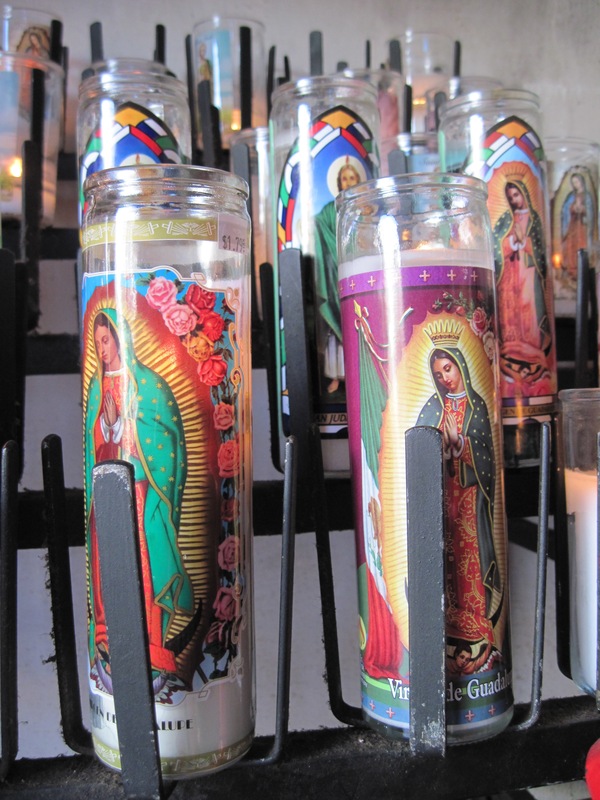 We buy a bunch for our Los Dios celebration here, but use them all year long. They last a long time and make great night lights in the bathroom. The art work on them is just a decal, but they look good when the candle flame back lights the image. That photo of a photo from the calendar is great. I have a friend who does portraits. It is definitely an artform in and of itself. You have me longing to head down to Tuscon to go to the mission at San Xavier. I had been longing to go there again, but now you’ve really kindled that! I hope to get there in 2011 spring. Once again, incredible prose to go with the images. You are a whiz and genius at this! Oh! I missed this one. Thank goodness I was browsing. I love that the church has chosen these large glass candles for their “votives”. I buy these from time to time when I spot one at the grocery store that attracts me. The most recent, of course, was one showing the Mary Immaculate image. Thanks for your beautiful virgin from your Amnesty International calendar–and for the candles. It has been so wonderful seeing all your posts and photos. Lovely veladoras!That Tibetan virgin is so beautiful! I’m so glad i was here to see all your awesome shares!I look forward to more!Thank you! Beautiful candles but the Virgin from Amnesty International is a wonderful and beautiful surprise. Thank you for posting her. Lovely sentiment and prayer too. A very beautiful post! Love the gentle yearning in the last haiku! 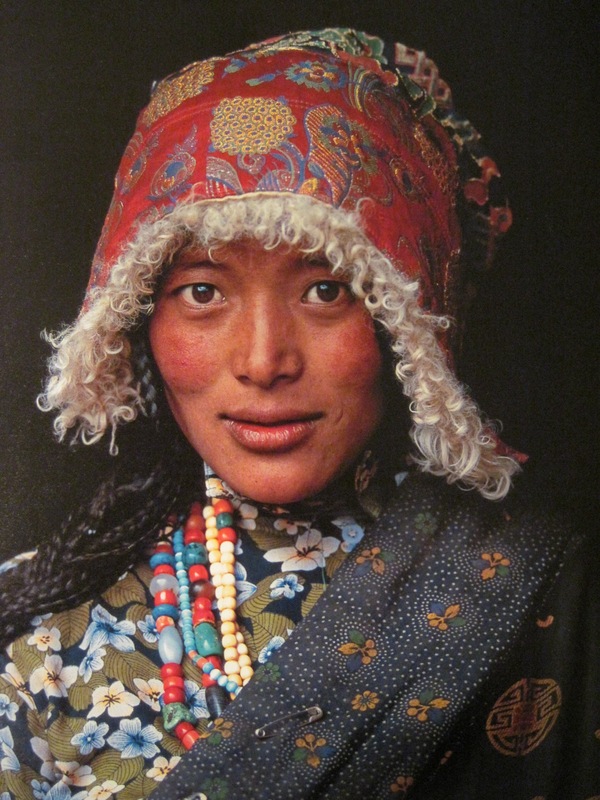 The candles photo is good, but ohhhhhhhhh, that Tibetan girl is absolutely tops!!! I love that one especially. My Ruby Tuesday LINK There you’ll find a special link, also, to my Christmas Day Giveaway if you’d like to join for your chance to win!! Love the candles — but the Tibetan “virgin” is wonderful, as is the haiku. Great multitasking for various memes……. finally….making the rounds!…thank you for your well wishes and encouragement while i have been under the weather. i love your virgin offerings. and am thinking of how to continue a sunday “gathering of hearts and minds”. thank you for every wonderful post here! i have posted today with an invitation to continue on sundays….